Study how the temperature inside a Bunsen burner flame varies with position. Compare the temperatures of different flames (candles vs. Bunsen burner). Check the calibration of ovens. Experimentally determine the melting point of copper, bismuth, or other solids. Measure the temperature of dry ice or liquid air. The Thermocouple may require a compatible interface and software. Choose a platform below to see compatible interface and software options. The Thermocouple is fully supported with LabQuest 2 (version 2.8.5), a standalone data logger with built-in graphing and analysis software. The thermocouple wire is insulated by a high-temperature glass that has a lower maximum temperature (704°C, 1300°F) than the wire itself (1400°C, 2552°F). 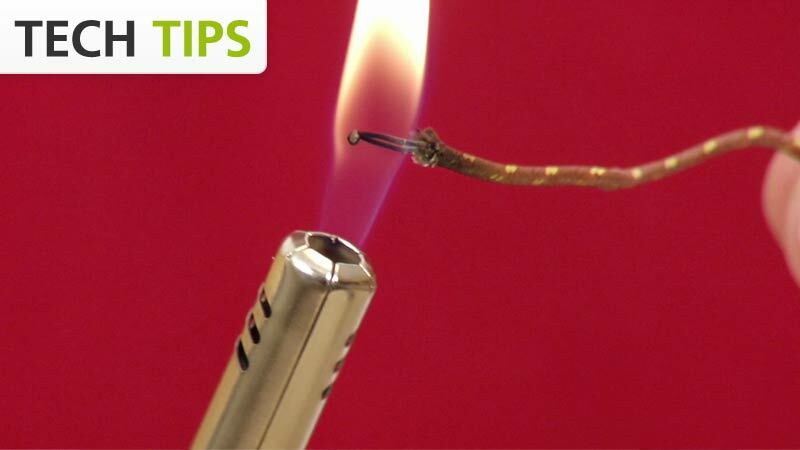 Therefore, in use, place only the tip of the wire in the heat source and keep the insulation out of direct contact with the heat source. The default data-collection range for the Thermocouple is set to have the best accuracy between 0°C and 900°C. There are two other settings available for data collection if you would like increased accuracy at a lower temperature or a higher temperature. The low setting has the best accuracy for temperatures between –200°C and 0°C. The high setting has the best accuracy for temperatures between 900°C and 1400°C. From the Experiment menu, select Set Up Sensors. Select your interface. This will open a new dialog box. Click on the sensor icon button to display the drop down menu and select the temperature setting you would like to use. You should not have to perform a new calibration when using the Thermocouple in the classroom. The sensor is custom calibrated before it is shipped. If you wish to calibrate the sensor, you must conduct a three-point calibration using Logger Pro or Logger Lite. If you choose to store this calibration to the sensor, you will have to overwrite either the high or the low factory-installed calibrations. Thermocouples make use of a property that occurs when two wires composed of dissimilar metals are joined at both ends. When one of the joined ends is heated, a continuous current is created and flows in a thermoelectric circuit. The small open‑circuit voltage of this circuit (known as the Seebeck voltage) is a function of the junction temperature and the composition of the two metals. (The Vernier Thermocouple uses a type-K thermocouple wire.) By measuring the voltage, the temperature at the joined end can be calculated. Measuring the Seebeck voltage requires connecting a voltmeter’s leads to the thermocouple wires. This new junction creates an additional thermocouple. In order to compensate for this new thermocouple, we use a method called cold‑junction compensation. This method requires knowing the temperature at the new junction. Traditionally, these junctions were held at 0°C in an ice bath. The Vernier Thermocouple performs a direct measurement of the temperature of the reference junction with an integrated-circuit amplifier. If you have watched the related product video(s), followed the troubleshooting steps, and are still having trouble with your Thermocouple, contact Vernier Technical Support at support@vernier.com or call 888-837-6437. Support specialists will work with you to determine if the unit needs to be sent in for repair. At that time, a Return Merchandise Authorization (RMA) number will be issued and instructions will be communicated on how to return the unit for repair.